The Question is the Answer: Who Created Flamenco? My mother, originally from the Bay Area and an American, and my father, a Flamenco guitarist and Gitano (Spanish Romani), moved to the San Francisco Bay Area from Morón de la Frontera, Spain to the San Francisco Bay Area shortly before I was born in 1979. They came with my older brother and sister in pursuit of opportunities for my dad’s musical career. There was an established history of many generations of renowned Flamenco artists in our family, and an established history between the town of Morón and San Francisco. Several books were and continue to be written about the familial dynasty of Flamenco artists known as the Gastoreña Family and the music of the town of Morón, but two books in particular are what first beckoned foreigners to the small, closed community: Una Forma de Vida / A Way of Life and El Arte de Flamenco/ The Art of Flamenco. In both of them, Flamencologist Donn E. Pohren, attempted to narrate the story of our family, while documenting and celebrating Flamenco history. These books sent foreigners enamored of Flamenco out to the olive groves of Andalusia, hoping to learn about our music and culture. That was back when there was no running water, only one telephone in town, and my mother was just 18 and studying flamenco dance. She arrived and promptly fell in love with my dad. She moved in with my father’s family and developed a deep connection with my abuela (grandmother) who took her very much under her wing during her time in Morón. I grew up in the United States and did not live in Morón until I was studying abroad at the University of Seville in 2008. I had decided to spend a semester studying in Spain after leaving community college and before transferring to Berklee College of Music,. I had already studied the history of Romani people and Gitanos whenever possible but, as the internet was just emerging and Roma academics just beginning to develop an organized presence online, most of my sources were in the libraries of San Francisco and revealed themselves to be at best inauthentic and at worst racist. They were clearly not written by Romani scholars. I found one precious book by Dr. Ian Hancock, The Pariah Syndrome, but otherwise took all I read with a grain of suspicious salt. At the University of Seville, I signed up for two classes in Flamenco, and a class called “The History of Spain through Film.” I did not initially reveal my family background, and was keenly interested in observing how our history would be presented to the average exchange student. My experience was mixed. None of my teachers were Roma but one Flamenco history teacher was an excellent Flamenco guitarist who had grown up in Triana, the old Gitano neighborhood of Seville. His childhood friends were mostly Gitanos and they had shared their art with him. He was an elegant artist who was a respectful appreciator but not an appropriator. When I did ultimately tell him who my family he was, he was delighted and from then on not just a good teacher, but a kind ally who provided good counsel to me as a musician and a student during my time at the school. My “Spanish History through Film” teacher showed a documentary that, to my amazement, was largely about relatives of mine who had had a cultural exchange of Flamenco for rock ’n’ roll with the American soldiers who lived on the US military base just outside of Morón. I learned that the rock ’n’ roll that came into Morón through this musical exchange, was ultimately shared with friends in Seville and contributed substantially to the emergence of a counter culture that would motivate the movement to end of Spain’s dictatorship. This professor also notably had made an effort to make sure that his class narrative included the participation of Roma in the story. And then there was the day we had a substitute in Flamenco History. He sternly began by asking the class to consider one important question. His voice boomed through the enormous empty theater, which our 40 or so in numbers only sparsely filled. Pausing for dramatic effect he scowled at the group of Americans and slowly asked, “Is Flamenco GITANO, or is it SPANISH?” It was clear from his intonation where his opinions lay. The loud vibration of his voice projecting through the space and the startling content of his question knocked the breath out of me like a wave that had snuck up when my back was to the ocean. I felt myself gasp and begin to shake. I was alone in this emotional experience of course—my classmates had little insight into the implications of the question. I decided to answer. I spoke about the letras or words to the songs having Romani-calo words interspersed with Spanish, the music written for specifically Gitano traditions such as weddings, and the music based in historically Gitano-dominated trades like metalsmithing, I talked about how Gitanos learn Flamenco at home and inherit music, learning a particular family style, while non-Roma learn Flamenco at a school and not through a familial knowledge base. I spoke about my family, I spoke about Flamenco being an alchemical response to the terrible oppression and racism that has ruled Gitano life through much of Spain’s history, with its quejillos (laments)and its depth of feeling transforming overwhelming pain into a thing of beauty that heals both the listener and the artist and becomes the refuge for a marginalized people. I spoke of deeply felt experience and indisputable facts. He turned red and became angry. He was caught off guard by my answer, and had not expected to defend his emotional opinion that was devoid of factual support. He passionately declared that if Flamenco were a creation of Romani people, then it would occur wherever Romani people lived and not exclusively in Spain, and since that was not the case it was indisputable that Flamenco was a Spanish invention. He further announced that anyone who tried to convince you that Flamenco was a Gitano art form was only doing so to try and con you out of money. What a strange and painful and isolating moment in my life. To have a person in an authority position use their privilege to gaslight the truth of the origins of my own family history, and then spit a vicious and false stereotype in for good measure. I sat with this startling and strange declaration for quite some time after that class ended that day. Afterwards, I began to notice a concerted effort in academia and in Spain to minimize or erase the fact that Flamenco was created by Gitanos, the Spanish Roma. Apparently some non-Gitano Spaniards need to expressly credit the creation of Flamenco to Spaniards and not Gitanos. While I could spend hours easily disputing why this is preposterous, that is another essay, and the real answer here lies in the question. Why would you ask whether or not this extraordinary cultural treasure was to be credited to either Spaniards or Gitanos (Spanish Roma)? Why the need to specify? How and when is this important? Only if Gitanos are not Spaniards. This offensive and ridiculous question exposes that whoever asks it believes that Roma citizens of Spain, who have lived in Spain for more than three centuries, are not Spanish. Even when you are q citizen of Spain, who has only ever lived in Spain, with ancestors who have only lived in Spain; who only speaks Spanish;—if you are Roma you are still not Spanish. You cannot be Roma and be Spanish. And since you cannot be Spanish and Roma, a Spanish Roma accomplishment is not a Spanish accomplishment. Apparently, ethnicity nullifies nationality. So before the debate even begins, the question confirms that bigotry supersedes logic in the asker’s world view. As such, it’s a nonsensical question. Flamenco is an amazing art form created by Roma in Spain using the musical elements they brought with them and those that were already there, and in response to centuries of oppression and hardship, and such cannot be separated from the history of Romani people in Spain. It is absolutely Spanish and absolutely Roma, an invention of Gitanos who are Spaniards, and who are also ethnically Roma. I am proud of my history, our survival, and my musical heritage. When I hear this question, I will always question the asking. Victoria Ríos is a singer/songwriter, music teacher, and activist. Originally from San Francisco, she lives and works in New England where she has started a community music center called Community Creations. 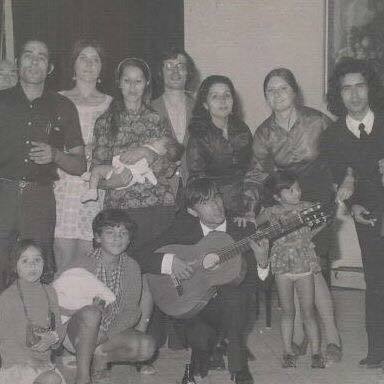 More on the photo from Victoria Rios: On the far right is my father (Agustín Ríos Amaya), next to him my mother (Patricia Ter Heun) and his sisters Milagro and Eugenia holding the baby, and Eugenia’s husband Manolo. Below with guitar is renowned flamenco guitarist and first cousin of my father, Diego de Morón. In back two American flamenco admirers.